The competition works to stave off irrelevancy by ending swimsuit nonsense, but it needs to do more. Miss America aired its 92nd Pageant Sunday night, accurately reflecting how much the world has changed since the ascension of misogynist Donald Trump and the emergence of the #MeToo movement. From changing the classification of the “pageant” to a “competition” and nixing the bathing suit category, there were many milestones in the historical competition, from the now famous Miss Michigan’s opening statement calling attention to the Flint water crisis to Miss West Virginia’s scathing denunciation of Trump. The competition was hosted by out comedian Ross Mathews, while Nia Franklin, Miss New York, took home the crown. She wants to use her platform to “make sure all students have access to a quality education.” Along with ending the swimsuit competition, this year's event allowed contestants to wear whatever they want, even outside the range of evening gowns (some wore Hillary-esque pantsuits!). Instead of the swimsuit portion, the women answered a question about current events, and there were some truly amazing answers. Miss West Virginia, Madeline Collins, called out Trump for being the biggest threat to the country, but Miss Virginia, Emili McPhail, had something just as important to say. When she was asked about her thoughts on NFL players kneeling to protest police brutality, she said that it's their right to protest and that it's “not about kneeling, it is absolutely about police brutality.” This statement comes in the middle of a fiery controversy spurred by Nike choosing advocate Colin Kaepernick as the face of their newest marketing campaign. The winner of the interview portion was Miss Massachusetts, Gabriela Taveras. She was asked how she would represent herself overseas if she were to get the crown and her answer was truly beautiful. She said it would be her duty as an American to let foreigners know we are “supporting them and that we are there to help them.” With the racial tensions caused by Trump, it was refreshing to hear what America’s true values should be. 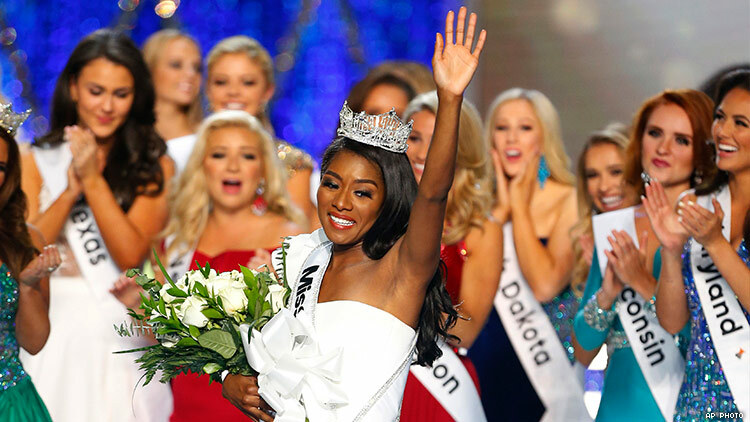 Even though Miss America has taken some pretty big leaps into the 21st-century, they still have a lot of catching up to do. One of the competition’s official rules is that you have to be a “natural born woman” to compete, therefore eliminating transgender women and non-binary women. This is unacceptable, and hopefully the competition will follow the lead of the Miss Universe pageant, which has allowed trans and non-binary women to compete since 2012. That policy paved the way for Miss Spain, Angela Ponce, to become the first transgender woman to compete for the title of Miss Universe this year. Miss America featured a lesbian competitor in 2016 — but not having the competition open to all women is a sign they still have a heel stuck in the past. JESSICA POWERS is an editorial intern at The Advocate and a student at Northern Kentucky University.